Below are the secure payment methods we offer. Payments (except Pay Pall and transfer) walk through Rabobank. For credit card payments we pass on a portion of the costs. Your purchase is easy and free of charge, be insured up to € 2500, - up to 30 days after purchase by Trusted Shops. So to choose which speech for Pay Pall or Credit card is actually insure twice. You can pay your order by bank transfer. Choose this option when placing an order and you will receive an invoice by email. Once these are met, we will ship your order. We advise you to choose this option if your product is not in stock. Administration costs for paying the account after the delivery is 5%, with a maximum order amount of € 75, -. 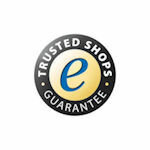 You can insure themselves after placing an order free of charge for the purchase price through Trusted Shops. You will receive your invoice after your order on this site automatically by email. We take immediately after your order by e-mail contact you about the expected delivery time. You must pay in advance. Once the payment has been made, the order will be sent immediately. Products purchased in our showroom or collected can advance, cash or debit card will be settled.